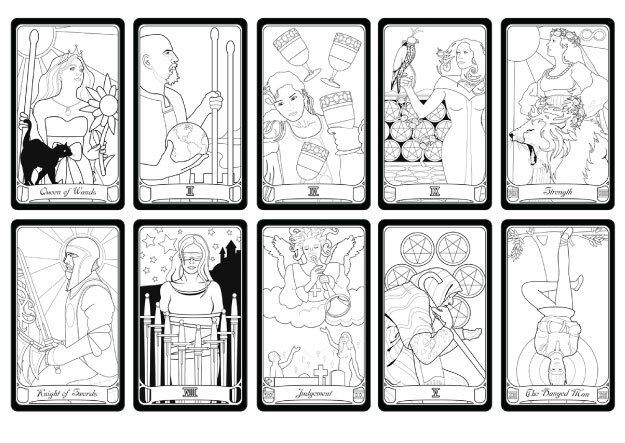 Color Your Own Tarot Deck! As the online destination for Tarot, we at Tarot.com were ecstatic to learn about a Kickstarter campaign to fund a private re-print of the Color Your Own Tarot deck and couldn't wait to share this news with you! 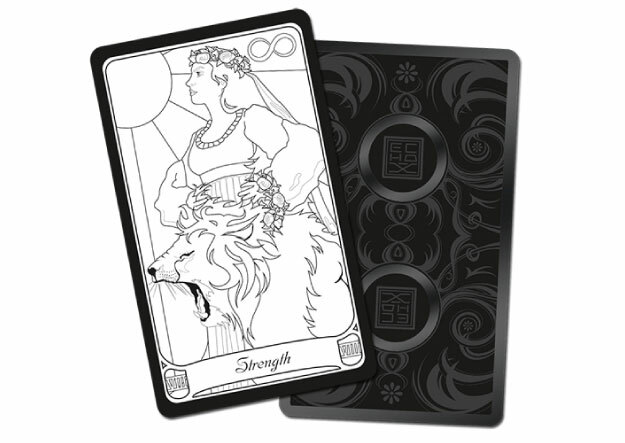 The Studio of Echo Chernick, one of the world's premiere Art Nouveau artists, originally created and published this deck in 2006 under the name "Doria Columbia's Color Your Own Tarot". Echo Chernik's clients include: Celestial Seasonings, Disney, Mattel, Random House, Regal Cinemas as well as numerous covers and projects for Llewellyn Worldwide. In 2009, Echo illustrated Llewellyn's Astrological Calendar. You may view her complete client list here. This new release will feature updated artwork, a new deck box, and the potential (through the Kickstarter campaign) of acquiring a limited edition deck box. The face of the cards will have a matte surface for easier coloring while featuring a glossy back for visual appeal. The Kickstarter campaign ends Sunday, May 29, 2016. Click here to visit the Kickstarter campaign. Tarot.com: What was the inspiration behind your creation of this deck? Echo: Like many artists, I am a huge fan of the Tarot. There are not many subjects out there that offer the plethora symbols, design, and deeper meaning all tied together with a package of gorgeous artworks in many different styles and interpretations. My favorite deck is the Visconti Sforza deck, the originals which I had the chance to view when I was a student in New York City some twenty five years ago. I have been blessed with the opportunity to work on several Tarot themed projects lately -- which tie in beautifully with our opportunity to re-release my Color Your Own Tarot deck. Tarot.com: How did you come up with this unique concept? Echo: I was originally hired to create the Color Your Own Deck based off of the Rider-Waite Tarot deck. Much of the symbology stays true to the Rider-Waite deck. However, I took it upon myself to re-illustrate it in such a way that it was interesting and easy to color. Tarot.com: The illustrations on each card are beautiful! How long did it take you to illustrate the entire deck? Could you explain your creative process? Echo: Thank you! For the original deck, I was given approximately three months to illustrate it. Which is a very short period of time for such a large body of work! I work from reference, so I shot reference poses for the figures. I would do my drawing on vellum (my preferred medium). I illustrated the deck with careful consideration to line weight and ease of coloring. I wanted the deck to be enjoyable to color, so I focused details in some areas, while leaving others open to the (coloring) artists interpretation. There is room for the artist to add details and highlights without running into my line work. Tarot.com: What inspired the illustrations in the cards themselves? Echo: My goal was to make the cards not only easy to color, but interesting. I do a lot of art nouveau in my mainstream illustration - and even though this is not an art nouveau deck, you can see my decorative tendencies in the designs. Tarot.com: Which cards in the deck are the most compelling to you? Echo: The Tarot has always fascinated me because of the evocative images and complex symbols. The original illustrator of the Rider-Waite deck was named Patricia Smith, and very few know the contributions she made to that deck. Even A.E. Waite's own writings don't address all of the symbolism and there is so much to sink your teeth into! One of my favorite cards is Strength. The Visconti-Sforza card for Strength features a man beating a lion into submission. Smith took her inspiration from Nicolas Conver's cards where a woman holds open the mouth of a lion, but Smith added sensitivity to the scene. Rather than merely control the beast, the woman is carefully addressing it, as if soothing the beast instead of merely forcing it under her control. When I thought about that, I wanted my strength to be more than a lion tamer. She should be a lion wielder. In my deck, Strength is using the lion as her personal agent. She may be restraining him, but not to protect herself but to protect others. She looks forward into the distance attempting to determine if there is a threat that needs to be met. The lion could be her ferociousness, her temper or her ability to get things done. In any case, the lion is a part of herself and I prefer that image. Other cards in the deck, as it was originally published, didn't meet my vision. This one will. On a personal note, the Ten of Pentacles is also one of my favorites in the simple fact that I used myself, my husband and my younger daughter as the models. 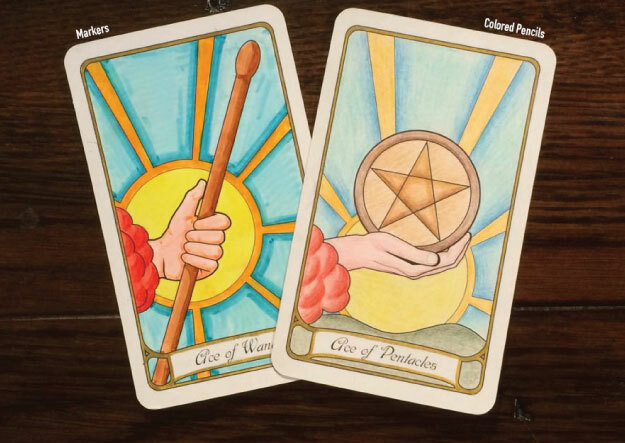 Tarot.com: What are the benefits of coloring your own Tarot deck? Echo: What makes Tarot beautiful as a whole is the gorgeous array of artwork. By having the opportunity to color your own deck, you have the chance to personalize and create something truly one of a kind. The artwork will be yours contains the very spirit of the person coloring the deck. I spent a long time making the line-work clean and easy to color -- but nothing brings it to life like the personal touch of the owner of the deck. I am interested to see how people choose to color their decks, it would look completely different if painted in all cool tones versus all warm tones. I have a good friend who puts an amazing amount of time into coloring line work, and her spirit really makes the pieces come to life! 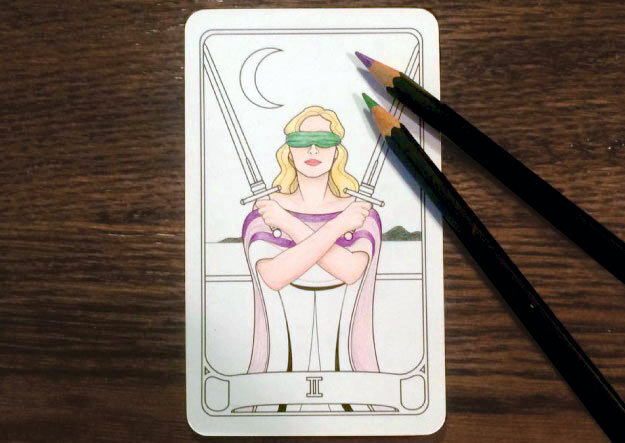 Coloring your own Tarot deck makes it one of a kind and uniquely yours. It contains your passion and creativity, and can never be replicated. Tarot.com: What are the benefits of pledging through the Kickstarter campaign? Echo: A huge benefit of pledging through the Kickstarter is that all decks will be signed by the artist! We will also be offering an alternate Kickstarter only Magician card. This means that you can only get this card exclusively through the Kickstarter campaign. There are reward tiers available at many levels. For a $20 pledge, you will receive a signed deck of cards -- including the bonus Kickstarter only alternate Magician. There are levels for purchasing several sets of decks as gifts, including discounts for larger orders. In addition to the re-print of the deck, you have the opportunity to pledge for a Coloring Folio at the same time. The Folio is a collection of line drawings of some of my other popular works. Instead of being a bound book, we chose a large format folio, holding individual, one sided sheets ready to color. This is ideal for left handed individuals, and for easy framing of your pieces. The folio allows for easy storing and transport of your creations. To pledge visit their Kickstarter campaign here!